McCook Army Air Base, activated April 1, 1943, was one of eleven Army Air Force training bases in Nebraska during World War II. The base was under the command of 2nd Air Force Headquarters, Colorado Springs, Colorado, and provided final training of heavy bomber crews for the B-17 Flying Fortress, B-24 Liberator, and B-29 Super Fortress. Some 15,000 servicemen and 500 civilians were stationed here. Among the bomb groups trained at McCook were elements of the 8th, 15th, and 20th Air Forces. These bomb groups saw combat in the European, Mediterranean, and Pacific Theaters. 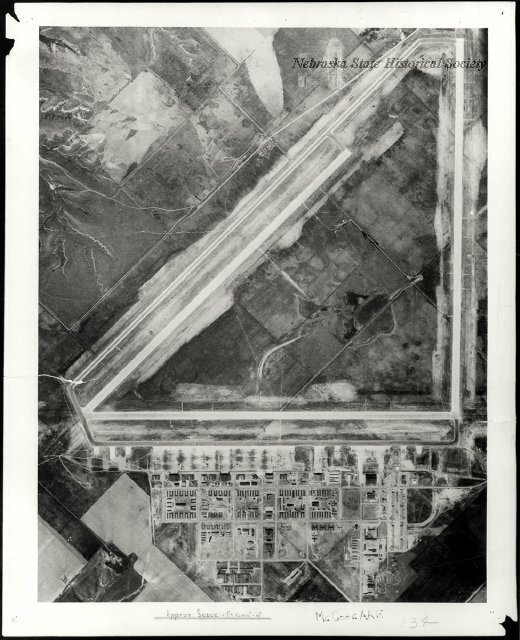 The 2,100-acre base included three 150 by 7,500-foot concrete runways, five hangars, and barracks for 5,000 men. It operated with three divisions: Base Services (hospital, chapel, theater, band, gymnasium, fire station, post office, photo lab, library, and military police); Maintenance and Supply (air service groups, post engineers, machine shop, warehouses); and Training (celestial navigation, gunnery and bombing, communications, radar, and aircraft maintenance). The base closed December 31, 1945. “McCook Army Air Base,” Explore Nebraska History, accessed April 18, 2019, https://mynehistory.com/items/show/429.